Now, one of the things about this service is that what's on offer to you depends on which country you live in, fair enough, right? When I heard this, I literally groaned. I live in New Zealand and that generally means not a lot is on offer to you, we mostly get paperbacks, we don't get books the same day as everyone else, etc, but I was certainly surprised with what was available for NZ readers. I honestly thought I was going to have nothing to read, but after looking through Scribd's 'on offer' books, I found around 25 books that were on my TBR and ended up adding some to that list as well. Good job, Scribd. Scribd has a huge range of different genres for both books and audio-books, what's shown below is only two thirds of the categories. When you select a genre, you end up being shown what's new, what's popular, and a heap of extra other suggestions based on what you've read. 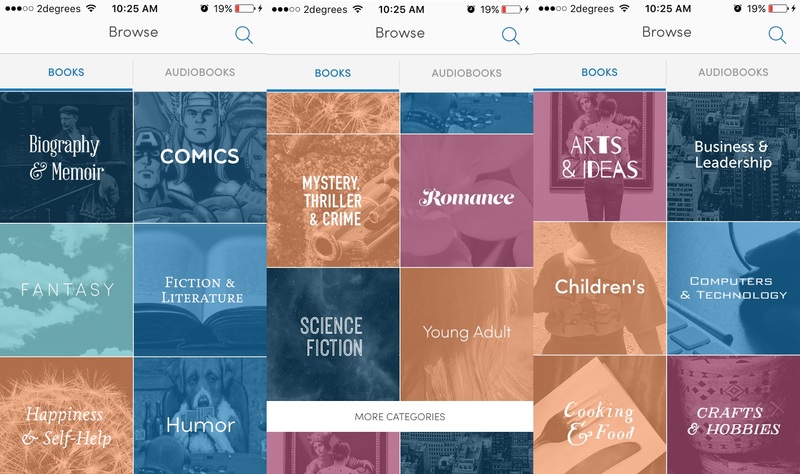 Like many bookish applications/services, Scribd allows you to add books and audio-books to your library. Within your library, you can have collections. My collections are "TBR" and "Audio-book TBR" once you're done reading a book, you can simply remove it from your library. Other common features are things like being able to give the books you've read a star rating, writing a review and reading other people's reviews. Additional standard features while reading include: being able to change the background colour of the screen (I personally prefer sepia, so it's not too bright for your eyes), changing the brightness, the font, the alignment of the text and font size. Recently, I discovered that the first ten or so copies of The Lumberjanes were on Scribd and promptly binge read them all. I honestly did not expect them to be available to me, like I said I'm sitting in little ol' New Zealand, but there are also absolutely heaps of comics that I'd love to read, something that I wouldn't really be able to do without Scribd. It's absolutely incredible to be able to read comics on a tablet, the colours are beautiful and extremely vivid. 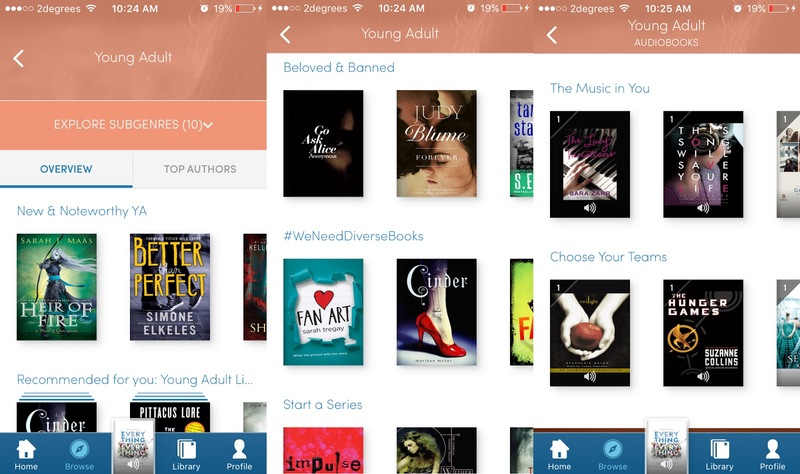 One of my most loved features of Scribd is some of the titles of their categories, there's "Beloved & Banned", "#WeNeedDiverseBooks" and I've also seen one titled "Strong Female Lead", I think putting these books in sections where they're so easy to find is absolutely fantastic. I definitely found a few excellent reads in those sections. Personally, I'm in love with Scribd, but I know eBooks aren't really for everyone, it's not the same as holding a physical copy of a book in your hand, but reading an eBook allows me to buy hardcover versions of books without the guilt of perhaps not liking it and sitting there wishing I'd been able to read it first. This subscription service definitely allows me to do that with ease! I am definitely recommending Scribd to anyone who has the chance to use it, it's a fantastic and affordable service. I've done a lot of research into finding companies who provide reasonably prices audio-books and it's certainly not easy, but Scribd is the absolute perfect app for me. Check it out below, I'll also link all their social media. Just so you know, Scribd offers a fourteen day free trial, so you can test the service for yourself before beginning to pay for it! Make sure to take advantage of that offer, I hope you end up loving Scribd as much as I do. *Disclaimer: I have not been paid to write this review, I'm just seriously in love with this company. I hope you enjoyed this suggestion/review of Scribd, I certainly enjoyed writing it. Thank you to all of you on Instagram who suggested topics for Tech Tuesday, I really appreciate it, I've got a few weeks posts to plan now! If you've got any suggestions for what I should review next, make sure to leave it in the comments below and don't forget to subscribe!